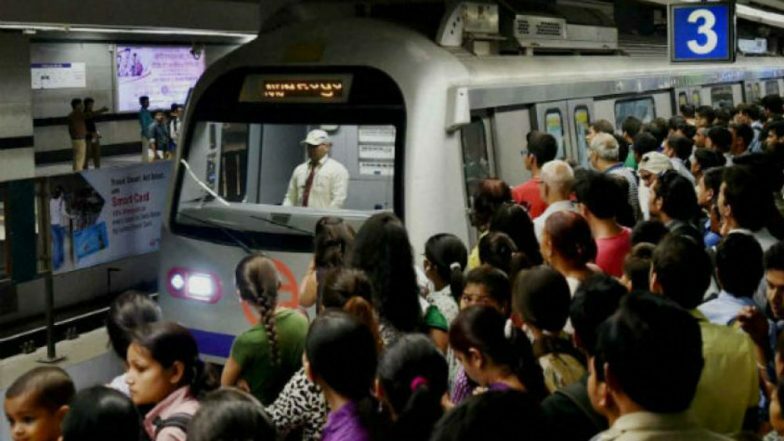 New Delhi, April 16: A 40-year-old woman suffered head injuries on Tuesday after her saree got stuck in a carriage door of a Delhi Metro train as it was about to leave a station, due to which she got dragged on the platform, her husband said. The victim, Gita, was travelling with her daughter when the incident took place at the Moti Nagar metro station on the Blue Line. Delhi: Man Commits Suicide by Jumping in Front of Metro Train on Blue Line. Confirming the incident, a senior Delhi Metro Rail Corporation (DMRC) official confirmed said the incident was reported at Motinagar station (Line-3) at 9.19 AM where a woman passsenger's saree got stuck in the train doors while de-boarding from the metro train going towards Vaishali.